Received some pre-event ‘teaser’ information on the new 6 Series Beemer. The old 6 Series, like the 635 CSI were fabulous sporty cars, and according to the reports, the new 6 will also be performance vehicles. The new car, to be released at the IAA auto show in Frankfurt in September (along with the X3 compact SUV) is based on the platform of the new 5 series (yet to come) but will be much lighter by use of aluminium front panels and suspension subframes. The engine will be the same 4.4 litre V8, as used in the BMW 745i. It will also be available in diesel form, using a 3 litre engine. A 6 Series cabriolet will be shown at the Geneva Motor show in March next year. 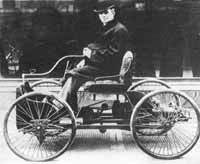 This year, 2003, marks the centenary of Ford Motor Corporation, but Henry I was active before 2003, as can be seen in this photograph of Henry in his original 1896 vehicle. And no, this was not a Model T.
Ford was working for Thomas Edison when he built this car. In 1899 Ford drove it the sixty miles from Detroit to Farmington, then to Pontiac, and back to Detroit without a hitch. People were impressed and an entrepreneur William Murphy together with William Maybury, Mayor of Detroit, established the Detroit Motor Company and put Ford in charge. Unfortunately the company bombed, probably because Henry Ford I was rarely seen at the factory. Henry Ford’s next venture was to build a racing car. This beast had a flat-twin 8.6 litre engine producing 26 bhp. Much of the ancillaries were not built by Ford, but by his team of helpers, including a dentist who made the porcelain jacket for the coil. This car was completed by May 1901 and Ford entered a challenge race in October at Grosse Pointe, near Detroit, and there were events for steamers, electric vehicles and those with internal combustion engines. On the appointed day, the field for the 25 lap Grosse Point feature race for the internal combustion cars, which were much faster than the other categories, had only two entries - Henry Ford and an Alexander Winton from Cleveland, Ohio. Ford was definitely the underdog as Winton was well experienced. The fastest man in America versus a Detroit mechanic seemed so one-sided that the organizers reduced the race from 25 laps to 10! After a slow start, Ford began to catch the favourite Winton, and egged on by his riding mechanic, he caught and passed his adversary, to win the event. And $1000 - a very large amount of money in those days. Henry Ford I did not consider that he had just begun a career in motorsport, reputedly saying after the event, “Once is enough” and retired as a race driver. However, Henry’s name was again in lights and the Henry Ford Company was born. CEO Henry Ford was still in trouble in the corporate world however, and after only four months he and his backers had a showdown. Henry left with $900 and the plans for his new racing car. The new cars (he built two of them) were 18 litre monsters and they were campaigned all over America by professional cyclists, Tom Cooper and Barney Oldfield. These Ford specials were so successful that Henry Ford was able to open a new company which he founded with a wealthy coal merchant, Alex Y. Malcolmson. This new company was initially called the Ford and Malcolmson Motor Company but, in 1903, it was renamed the Ford Motor Company. The Ford dynasty was born and 100 years later FoMoCo still exists and another Ford (Bill) is at the helm. I think Henry I would have been proud. Forget Hydrogen as the fuel source, says Toyota. Hybrids are the way to go. The number 3 Automaker in the world is Toyota Motor Corporation, and we have already looked at the phenomenon which is Toyota. Reliable and dull, in my books, but they sure sell some cars. In their defence, Toyota has also embarked on a research and development programme which has brought it to the forefront in the hybrid gasoline-electric vehicles. It already has three in production, and according to Automotive News in the US, is poised to add three more to its American line-up in two years time. It also is studying the feasibility of a V8 hybrid for its Lexus Division. This hybrid derived from the Lexus RX 330, will be called the RX 400H when it goes on sale next spring as a 2005 model. However, the redesigned Prius sedan will go on sale in October this year. The Prius, by the way, has sold 140,000 units worldwide since its 1997 launch. In a June interview with Automotive News in Tokyo, Toyota President Fujio Cho said they were preparing to double its hybrid vehicle line-up to six by 2006 by adding the SUVs. The other vehicles currently in production are hybrid versions of the Estima minivan and Crown luxury car sold only in Japan. The redesigned Prius is priced at USD20,480, unchanged from the old model. It is offered as a five-door hatchback that has the interior space of a mid-sized sedan, and is expected to average combined city and highway fuel economy of about 55 mpg, up from 48 mpg for the current version (a 15% increase in economy). Toyota expects to sell 36,000 Priuses a year in the U.S. market and 12,000 RX 400Hs. Dave Hermance, executive engineer for environmental engineering for the Toyota Technical Center, said that the Toyota Camry was also in line to receive a hybrid engine. This would be a logical step as the Lexus RX 330, and the two SUV’s on sale in America are based on the Camry’s platform. According to some high executives in Toyota Motor Corp. the hybrid gasoline-electric engines could eventually be offered in the entire Toyota line-up, including the Corolla, the world’s biggest seller, and probably the only really “world” car. Another manufacturer in the hybrid marketplace is Honda, with the Insight, but with sales of only 790 units in the U.S. up till June, they are watching Toyota go out of sight! Sales have fallen almost 40%. However, the new hybrid Civic is said to be selling better in the U.S.
To emphasize the fact that the hybrid engines may be the way forward (or as an extreme form of ‘insurance’), both Ford and General Motors plan to launch hybrids next year. Again, according the Automotive News, Ford will introduce the Escape HEV, which it says will have comparable performance to the conventional version but return better fuel economy. GM will launch a hybrid Saturn Vue, which it says has been engineered for the way Americans drive SUVs. It will not be able to pull heavy loads and will be available only in front wheel drive. Like most SUV’s, it will not be bought for its off-road capabilities! According to a study released in January by J.D. Power and Associates, the market for gasoline-electric hybrid vehicles in the United States is expected to hit 500,000 units a year in five years, but while this may sound a large number, in total vehicle sales this is still only a drop in the ocean. However, only time will tell as to whether hybrids are the way forward, or a stop-gap while the world builds some Hydrogen fuel pumping stations, making for a real gas-stop. Last week I mentioned that the first year of the World Championship was 1950 and the leader, going into the final race, was the legendary Juan Manuel Fangio; however, it was Farina who took the first annual title. I asked what happened? The answer was that Fangio, on 26 points did not finish as his gearbox packed it in, handing the very first World Championship title to Farina who had started on 22 points. But for a gearbox, Fangio could have won six world titles, instead of the five, a feat currently equalled by Michael Schumacher. So to this week. A bandy-legged driver called Riva Davia became very famous later in his career. What championship did he win?